Cold Water Creek offers casual fashion, home goods, decor items, and accessories for women of all ages, as well as footwear, collectibles, and art inspired by animal life and outdoor activities. Visitors to the site will be able to take advantage of a 20% off discount when opening up a store credit card with this company. 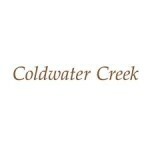 Email newsletter subscribers get 10% off of their first order from Cold Water Creek, and the Sale section of this website is home to discounts good for up to 50% off. The Clearance merchandise available from this company is marked down by up to 75% off of original prices.